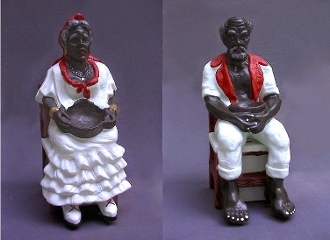 These two folk-spirits are often seen in botanicas and in the homes of those who practices Espiritismo (Spiritism) and/or Santeria. Francisco and Francisca were from the Dominican Republic. She was a powerful Vodou priestess (Mambo) and was married to Francisco when they were very young. They where inseparable until the day they died. Statues of Francisca are always accompanied by Francisco because in embajadas (ceremonies where they are invoked/evoked) she refuses to work without her life long partner. For this reason, they are wonderful spirits to evoke for help with love matters of all sorts. They are in a similar realm of spirits as Madama or La Madamas. Therefore, they are often evoked for general good luck, blessings, abundance and protection of a business or home. Their relationship signifies an undying, unbroken bond they shared through love and their spirituality. Something to be cherished, honored and respected. Due to Francisca being a a powerful and respected Mambo, she can also aid you in your spiritual work by lending her wisdom and power. Honor them with the first portion of your largest meal of the day, rum, incense, cigars, fresh flowers and candles. You will receive BOTH 11 inch statues.